The Dx-pH Measurement System revolutionizes pH testing. Our patented technology uniquely capable of sensing and recording both aerosolized and liquid pH levels allows for less invasive placement. This means improved comfort for your patients. 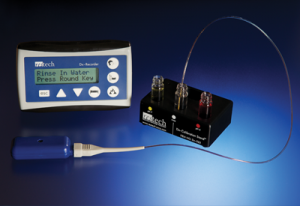 Restech’s Dx-pH Measurement System and it’s breakthrough technology measures a full spectrum of acid and alkali in either the esophagus or the airway. Rule in or rule out acid reflux and eliminate the need for empiric trial when assessing and diagnosing your patients. 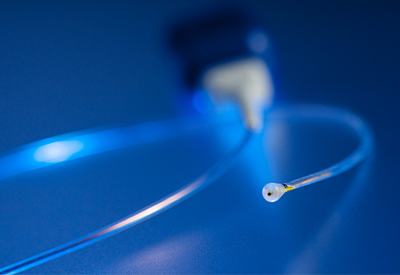 Restech’s Dx-pH Probe’s teardrop-shaped tip houses a sensor at the end of a catheter less than one millimeter wide. The unique shape keeps the sensor pointed down while it reads aerosolised reflux. Due to the unique configuration and positioning of the pH sensor, Restech has virtually eliminated the problem of false positives. The probe is placed posterior to the uvula in the oropharynx. Because it sits high in the airway, swallowing and speaking are not impeded. With a 25% smaller tip and softer polymer catheter than the standard Dx-pH Probe, the Primus is ideal for patients who are more sensitive or have less nasopharyngeal clearance. The tip of the probe is less than 2.4 millimeters in diameter and the smooth, flexible catheter allows for easy insertion in a small naris. Visual placement in the oropharynx guided by a blinking LED eliminates the need for manometry, fluoroscopy, or x-ray. 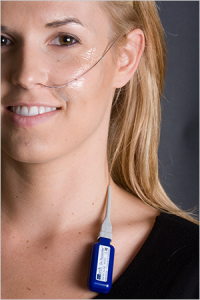 Because it sits comfortably in the airway, the Primus pH Probe does not interfere with speaking or swallowing while the patient continues with his or her normal daily routine. The Dx-System can also be used to monitor airway pH levels during sleep studies with a direct plug-in to a polysomnograph. Monitoring airway pH during a sleep study is particularly relevant for correlating silent reflux with respiratory symptoms and arousals from sleep.